O God, who on this day, through your Only Begotten Son, have conquered death and unlocked for us the path to eternity, grant, we pray, that we who keep the solemnity of the Lord's Resurrection may, through the renewal brought by your Spirit, rise up in the light of life. Through our Lord Jesus Christ, your Son, who lives and reigns with you in the unity of the Holy Spirit, one God, for ever and ever. » Enjoy our Liturgical Seasons series of e-books! Easter is the feast of feasts, the unalloyed joy and gladness of all Christians. In the very center of the Mass, the great prayer of thanksgiving, from the first words of the Preface, expresses the unrivaled motive for this joy: if it is right to praise You, Lord, at all times, how much more so should we not glorify You on this day when Christ our Passover was sacrificed, for He is the true Lamb who took away the sins of the world, who by His Death destroyed our death and by His Resurrection restored our life. Easter means, then, Redemption obtained — sin destroyed, death overcome, divine life brought back to us, the resurrection of our body which is promised immortality. With such a certitude, we should banish all trace of sadness. Haec dies quam fecit Dominus: "This is the day which the Lord has made." Throughout the octave we shall sing of the unequaled joy which throws open eternity to us. Every Sunday will furnish a reminder of it, and from Sunday to Sunday, from year to year, the Easters of this earth will lead us to that blessed day on which Christ has promised that He will come again with glory to take us with Him into the kingdom of His Father. Meditation - He is Risen! "I rose up and am still with Thee." After His labors and His humiliations, Christ finds rest with His Father. "I am still with Thee." This is perfect beatitude. Through His cross He entered into the possession of eternal glory. Christ has gained the crown of victory; through Christ men also win their crowns of victory. Humanity was under a curse and subject to the wrath of God. Now that they have risen with Christ, their guilt has been destroyed. "I rose up and am still with Thee." The liturgy places these words in the mouth of the Church that she may pray them with Christ. "The earth trembled and was still when God arose in judgment." The resurrection of Christ is the judgment and condemnation of those who have turned away from God. This judgment was prefigured by the angel who passed through the land of Egypt destroying the first-born of the Egyptians. The Israelites marked the doors of their houses with the blood of the paschal lamb. We are the new Israel, and "Christ our Pasch is sacrificed." We mark ourselves with His blood, which we enjoy in the Holy Eucharist. We have been pardoned, we are saved, we shall live. "He is risen." 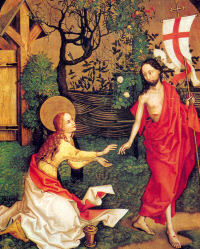 The resurrection of Christ is a pledge of our own resurrection. It is the foundation upon which our faith rests. It is the guarantee of our redemption and God's assurance that our sins are forgiven and that we are called to eternal life. "This is the day which the Lord hath made; let us be glad and rejoice therein. Give praise to the Lord, for He is good, for His mercy endures forever. Alleluia." "Christ our Pasch is sacrificed. . . . The Lamb redeems the sheep. Christ, the innocent One, hath reconciled sinners to the Father." — Excerpted from The Light of the World by Benedict Baur, O.S.B. The Station is at St. Mary Major, the principal church of all those that are dedicated to the Mother of God in the holy city. This is to associate with the Paschal solemnity the memory of her, who, more than all other creatures, had merited its joys, not only because of the exceptional share she had had in all the sufferings of Jesus, but also because of the unshaken faith wherewith, during those long and cruel hours of his lying in the tomb, she had awaited his Resurrection. "You are looking for Jesus of Nazareth, Who was crucified. He has risen, He is not here. . .Go, tell His disciples. . .that He goes before you" (Gospel). Yes; we, too, searchers after Christ, now confess we have found Him. The task before us is to "tell" others of His victory, that all may be "of one mind and heart" (Postcommunion). Why? Because if Christmas is the loveliest Feast as we behold God born of Mary unto man's life, certainly Easter is the greatest as we behold Jesus born of a tomb so that man may rise unto God's Life. Our faith in His Divinity is confirmed because He "overcame death;" our hope is enlivened because He has "opened unto us the Gate of Eternity" (Prayer). Is it any wonder that the "earth trembled. . .when God arose" (Offertory)? How are we to prepare for our Easter Communion? A Resurrection Day effort to "purge out the old" life for the "new!" How could we be nourished by the "sincerity and truth" of Divine Bread if it were spoiled by the "leaven" of an insincere will, or an untrue mind (Epistle)?